I’m available to discuss any of my books at your book club, either via Skype or In-Person (for those in the greater Los Angeles area or, potentially, Seattle.) Contact me if you’d like me to attend your club. Here are some possible discussion questions for my books. Click on a book cover to get the PDF version of the questions for that book. 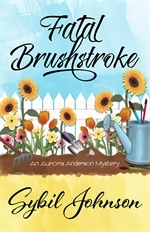 What can you tell about the main character, Aurora Anderson, from her actions in the first chapter? In what ways does Rory’s profession as a freelance computer programmer help in her sleuthing? Vista Beach, the setting for FATAL BRUSHSTROKE, is a small, fictional Southern California beach city loosely based on real cities like Manhattan Beach and Redondo Beach. Why would the author create a fictional city rather than set her story in one of the real beach communities near Los Angeles? What advantages does creating an imaginary town give her? Any disadvantages? 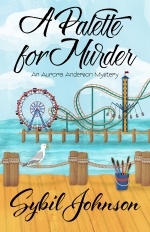 Rory relies on her best friend, Liz, to help out with the sleuthing. They are opposites in a lot of ways. Rory is tall, Liz short. Rory is fairly new in town, Liz seems to know everyone in the city. Rory is more reserved, Liz is extremely outgoing. How does having a best friend so unlike herself help Rory in the investigation? Rory was adopted at 2 years old and her birth parents were criminals. Nature v. nurture is a long-running debate. Which do you think is most important when it comes to human behavior? If you had a friend whose parents had committed crimes that hurt or killed others, how would you feel about them after finding out? Which actors would you cast in the movie version of the book? What scene in the book grabbed you the most? Why? Tole or decorative painting figures in the story. Did you know anything about the hobby before you started reading? Does reading this story make you want to learn more? What do you think the future holds for Rory and Detective Green? If you had only one question to ask the author, Sybil Johnson, about the book, what would that be? PAINT THE TOWN DEAD features a character who has narcolepsy. How much did you know about this condition before you read the book? Did your impression of it change? Have you ever attended a painting or craft convention or any convention at all? How did your experience differ from that in the book? Were there times in the story that you disagreed with Rory’s actions? Did any of the characters remind you of yourself or someone you know? Rory’s mother owns a decorative painting/scrapbook supply store where some of the events in PAINT THE TOWN DEAD occur. Do you have any craft supply stores near you that are similar? Have you attended events there? In the book there’s a dispute among residents of Vista Beach regarding the construction of a hotel downtown. Has anything like that occurred in your own community? Jasmine is one of Rory’s childhood friends. Their relationship has changed over the years. Do you have any friends you’ve had for a long time? How has your relationship changed? Discuss the relationship between Detective Green and Rory. How do you see it developing? How would you like it to develop? Which characters would you like to learn more about? Rory is friends with a homeless man. Do you find this believable? Why or why not? Does your community have an issue with homelessness? What are they doing to address it? What plot point surprised you the most and why? Were you surprised by the ending? Who did you want the killer to be? The story takes place in a Los Angeles County beach city. How important is the setting to the story? A PALETTE FOR MURDER features a chalk art festival. Before reading the story, had you ever heard of one? In the book, some animals need new homes. Have you ever taken care of an animal when its owner could no longer do so? Like the majority of the residents of Vista Beach, Rory doesn’t have air conditioning so she comes up with some creative methods to stay cool. Given similar circumstances, what would you do to deal with excessive heat? Rory is creating her own video conferencing software geared toward painting teachers so they can teach online courses. Have you ever taken an online course of any kind? What did you think of it? What are the benefits and drawbacks? If you could have a conversation with one of the characters, who would it be and why? DESIGNED FOR HAUNTING starts with Rory receiving an email from a company that sends out messages after someone dies or doesn’t respond for a period of time. Before reading the book, had you ever heard of such a company? Would you use their services? What would you do if you received such a message? 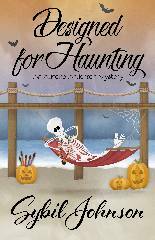 In the book, the town of Vista Beach is plagued by Halloween pranks. Has anything like that happened in your own community? The book features some Halloween events such as a pumpkin race and a business-to-business trick or treat event. What Halloween events take place near you? Did anything in the book surprise you? The Halloween Holiday Boutique features an escape room. Before reading the story, had you ever heard of escape rooms or been to one? What was your experience like? In the book, Rory’s painting chapter holds a charity event. Have you ever been a part of a group that puts together a charity event? How did it differ from the one in DESIGNED FOR HAUNTING? Raven Leek is a psychic. Have you ever visited a psychic? Do you believe in them? Vista Beach has a legend involving a shipwreck and ghost child appearing near the pier. Does your own community have its own ghostly legend? The painting chapter holds a costume party at the end of the boutique where some of the characters come in costume. What costume would wear for such a party? What do you think of someone secretly placing a location app on someone else’s phone?